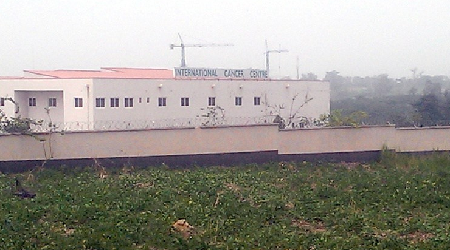 After being abandoned for eight years, the multi-billion naira International Cancer Centre, ICCA, an initiative of former Nigerian First Lady, Turai Yar’Adua, has been transformed into a cowpea farm. The erstwhile first lady secured a partnership deal with a key organ of the International Atomic Energy Agency, IAEA, in 2009 and then raised billions of naira in cash and materials from public and private sector donors to establish the ICCA in Abuja. In December, 2016, investigation by Premium Times revealed that burglars stormed the centre strategically located along the Abuja airport expressway and carted away power cables worth millions of naira. It is not known which other equipment have been pilfered from the locked up buildings. A recent visit by this newspaper to the centre revealed that the ICCA, which was overtaken by weeds last year, is still in state of abandonment and has now been transformed to a beans plantation. At the sprawling centre built on 7.3 hectares of land donated by the Nigerian government, rotting equipment, including about 200 donated mini-buses, depict a sad story of waste. Mrs. Yar’Adua had in July 2009, two years after her husband, the late President Umaru Yar’Adua, took office, flagged off the project with an elaborate fundraising event to mobilise N10 billion for the construction of the centre. The exact amount raised from donors, including public and private officials, was not publicly disclosed. Security men, who did not allow our reporter into the facility or agree to facilitate contact with any of the officials expressed dissatisfaction with the deteriorating state of the centre. When quizzed, one of the security operatives said officials of the centre visit the facility occasionally. “We are not permitted to speak with any journalist or allow them to gain entrance into the building. What you (Premium Times) told us about the state of the centre is true. Since the incident that occurred last year nothing has changed”, he said. “We are suffering here, no light. We’ve been living in total darkness every night till date and our officials told us that Mrs. Yar’Adua promised to rehabilitate the centre (but) nothing has been done. ”Nothing has changed, the only thing that has changed is the six mobile police officers, who were deployed to guard the centre”, he added. Efforts by Premium Times to speak with Mrs. Yar’Adua on the issues were unsuccessful as she is reportedly in London.